The biennial SMiRT Conferences bring together scientists and engineers who deal with fundamental aspects of engineering mechanics or with the development of realistic constitutive laws, or who apply strucural mechanics to problems of nuclear technology or establish structural safety for nuclear facilities. The discussions in SMiRT always aim towards a better and safer life in the world through improvement of nuclear technology. This is the governing philosophy of all Divisions and Conference Seminars of the SMiRT Conference. The intensive efforts and contributions of the late Professor Thomas A. Jaeger from the Bundesanstalt für Materialforschung und -prüfung (BAM) in Berlin toward the first five conferences helped to establish the SMiRT 12 Conference as a forum for ideas in structural mechanics in reactor technology. 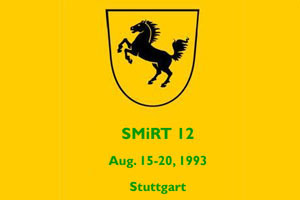 The SMiRT 12 Conference will be held in Stuttgart, Germany. As an open forum, SMiRT enables the discussion of engineering and scientific issues at the highest technical level with participation of representataives from University and research institutions, Industry and Government as well as regulatory bodies. Aware of the progress attained in many of its areas of activity, IASMiRT efforts are now devoted to assess these new results jointly with scientists and engineers from other fields, in a fruitful cross-breeding process whose ultimate objective is to reduce the risk to the environment posed by all forms of energy generation and industrial operation, through safer support and protective structures. These objectives are clearly reflecte in these Transactions, as well as in the Proceedings of Pre- and Post-SMiRT 13 Seminars. The support of the organizations and institutions listed in the introduction is kindly acknowledged. It goes without saying that they made the Conference possible.